Actual size: 2″ wide, wing-tip to wing-tip. Click to see larger. Back side of the wings. At 2″ wide, they’re large enough to be seen, but not so large that they stick out and dominate your shirt or jacket (or cap) — and the quality is obvious. “Top” view of wings — nice and thick! 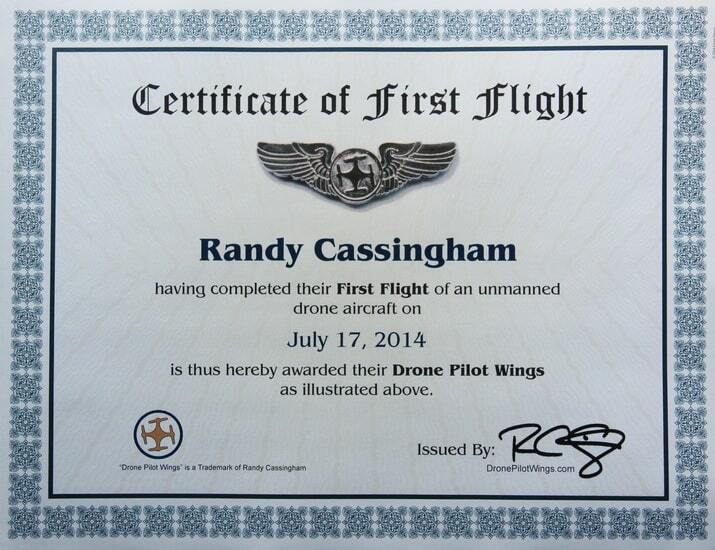 They come with a color First Flight Certificate to commemorate your First Flight. It’s all mailed in a tube so that the certificate isn’t folded, and can go right into an 8.5×11″ frame. And yes, you can get extra wings so you can have one for your shirt, hat, jacket, or equipment case, and you can also get wings without ordering a First Flight Certificate, if you prefer. 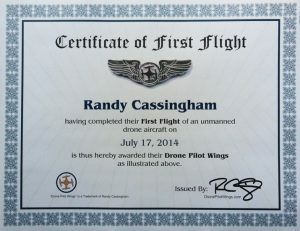 Sample First Flight Certificate — click to see larger, exact style may vary. For one or “a few” wings (with discounts on more than one), scroll down to order with or without a Certificate of First Flight. For bulk purchases (10 or more), get bigger discounts through our shopping cart. Use your Paypal account or debit/credit card to order. Shipping is included! The cost is thus slightly higher when sent to Canada or Overseas. Choose your number of wings first, then click the Buy Now button under it to order. Specify the Drone Pilot’s Name and Date of First Flight after you choose your payment method on the next screen. Thanks for your order! Q: Can I order and specify an anticipated future date for the First Flight? A: Absolutely! It's great to have the wings in-hand to give to a new pilot right after their first flight -- especially kids! Q: What if I don't know the exact date? A: A month/year is fine too. Q: How much extra is shipping? A: Shipping is included — that's why prices are slightly higher to Canada and Overseas. The price you see is the full price: no hidden charges! Q: I need to buy these for more than one pilot. How? A: You can change the quantity after you click the Buy Now button. Be sure to give us instructions with the pilot names and first flight dates with, or right after, your order. Q: I'd like to get quite a few for our team/department. Are there bigger quantity discounts? A: For bulk quantities (more than 10, wings only, not certificates), see our shopping cart. Q: Are the wings available in gold/brass/other finish? A: Nope: if they were, they'd of course be shown here. 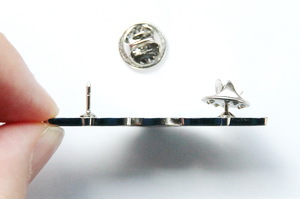 Check with a local jeweler to see if they can help you plate the nickel wings we offer. Q: I already have (or don't need) a First Flight Certificate. Can I just get the wings and save a little? A: Sure! See this page. Q: Can my certificate note my 14 CFR part 107 FAA certification? FAA Certification can be noted on your First Flight Certificate. No other printing alterations are available.